Previously, I have explained how to make it in Ubuntu. Now I explain here how to create USB bootable of any GNU/Linux distribution in Linux Mint using built-in program Mintstick USB Image Writer. 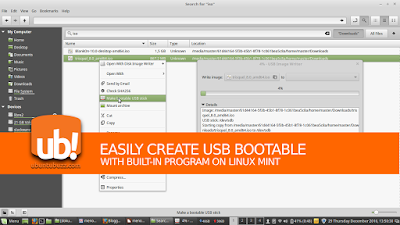 This is very easy and you do not need to install any other tool such as Unetbootin or Rufus. I use Linux Mint 18.1 Serena Cinnamon Edition to explain it. Prepare an image file of a GNU/Linux. You may have it by downloading, purchasing, or copying from your friend. In this article, I show you the image file of Trisquel operating system trisquel_8.0_amd64.iso. Plug you USB flash drive in. You will see the name of your drive appears on the file manager. Right-click on the image file > Make bootable USB stick > USB Image Writer dialog appears > select your USB drive name from the option > press Write button > type your password when asked > wait the writing process. 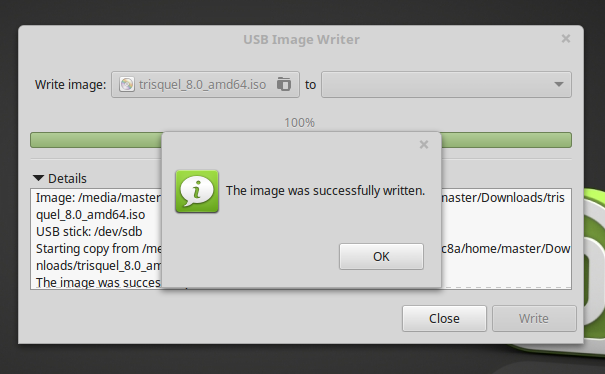 Once it's finished, you will see a notification dialog saying "The image was successfully written". Now you can use the USB drive for booting.